Letter published in the Church of Ireland Gazette, 2 Dec 2016 edition. 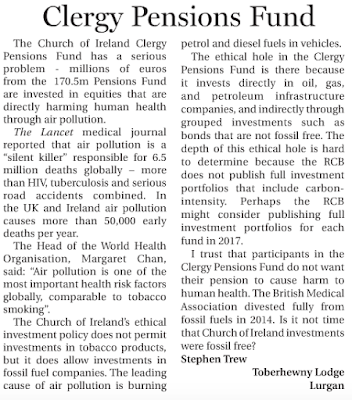 The Church of Ireland Clergy Pensions Fund has a serious problem - millions of euro from the €170.5m Pensions Fund are invested in equities that are directly harming human health through air pollution. The Lancet medical journal reported that air pollution is a “silent killer” responsible for 6.5 million deaths globally – more than HIV, tuberculosis and serious road accidents combined. In the UK and Ireland air pollution causes more than 50,000 early deaths per year. The Head of the World Health Organization, Margaret Chan said, “Air pollution is one of the most important health risk factors globally, comparable to tobacco smoking”. The Church of Ireland’s ethical investment policy does not permit investments in tobacco products, but it does allow investments in fossil fuel companies. The leading cause of air pollution is burning petrol and diesel fuels in vehicles. Many institutions promote ethical investment policies based on Environmental, Social, and Governance (ESG) factors. The aim is identify and invest in businesses what govern fairly and reduce the negative social and environmental impact of their business. “RCB is committed to having a strong ‘ethical’ as well as a strong financial ‘balance sheet’.” It is good to see that the Church of Ireland aims to be an ethical investor. Burning fossil fuels causes two major problems: air pollution and climate change. We need rapid change, not a gradual shift. The 2015 UN Paris Agreement urges governments of the world to commit to lowering emissions to ensure the global temperature increase remains below 1.5C. But it does more than that. In the US the Pentagon has called climate change a significant risk. Why is this the case? It is because increasing drought and flooding leads to food and water shortages, which in turn can cause social unrest, conflict and humanitarian disasters. Fragile states can quickly tip over to become failed states descending into civil wars.